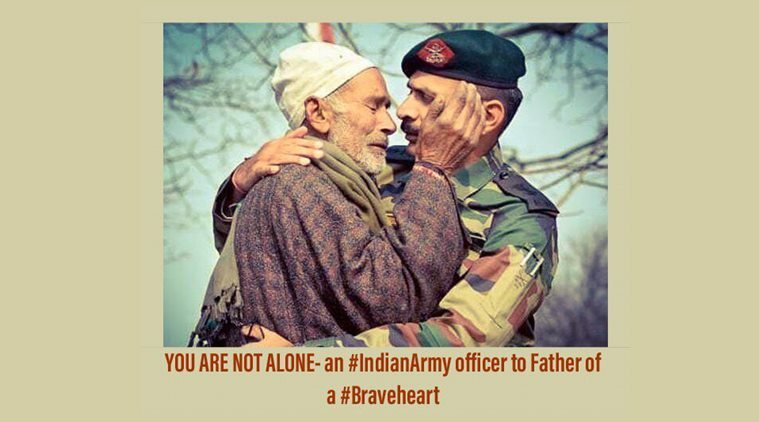 The photo taken at the funeral of Lance Naik Nazir Ahmad Wani has moved many online. Photos of Army personnel generally evoke a sense of awe and respect but this photo has been grabbing eyeballs for a different reason! It brings out another feature of our proud soldiers’ emotional makeup and that is compassion and the sense of grief they share with the relatives of deceased soldiers. Only the two men in it can feel the pain and the loss. Brother Nazir, you’ll be remembered as as a hero. May you find peace in God’s arms now. None of the member of defence personnel is alone. Entire nation is with them in all odd. Wani, who had won the Sena Medal twice, in 2007 and again this year, was killed on Sunday as part of the 34 Rashtriya Rifles in an encounter in South Kashmir’s Shopian district in which six militants were also killed. The body of the highly-decorated soldier, who is survived by his wife and two children, was laid to rest with full state honours and a 21-gun salute on Monday in Kulgam, his hometown. Meanwhile, security forces gunned down seven militants in South Kashmir, in two separate encounters on Sunday. Those killed included two Pak militants and three alleged top militant commanders. The encounters were followed by protests in which one person was killed and 50 others were injured.